As a kid, syndicated reruns of the 1966 series 'Batman' was a treat to experience as the Caped Crusader battled all of Gotham City's villains. The family-friendly show (pre-brooding phase) lived on as a cult classic even after only being on the air for two seasons. Fans can expect more campy superhero hijinks with Adam West, Burt Ward, and Julie Newmar reprising their roles in animated form when a new DC Entertainment feature is released later this year on DVD and Blu-ray. 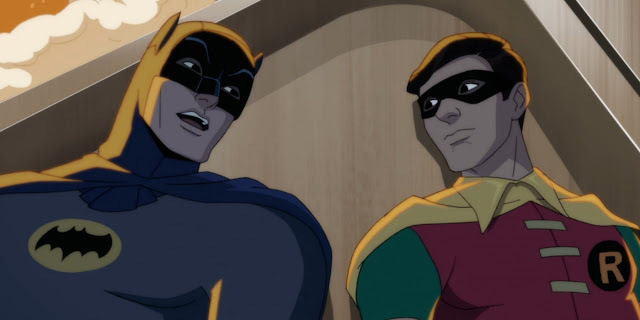 'Batman: Return of the Caped Crusaders' from Warner Bros Home Entertainment will feature the voices of West (Batman), Ward (Robin) and Newmar (Catwoman, one of three actresses who appeared in the role). The first teaser has arrived and as the Dynamic Duo are facing certain death, they conveniently begin the sales pitch for the new animated movie. The Riddler, Penguin, Catwoman and the Joker are teased to be included in the new adventure. 'Batman: Return of the Caped Crusaders' comes out for Digital HD on Oct. 11 and Blu-Ray on Nov. 1.